When major outbreaks of foodborne illness occur, news coverage tends to focus on the food's producers and manufacturers. It makes for good ratings and readership, but glosses over the fact that good food handling in the home can sharply reduce the risks. For example, informed cooks are well aware that chicken is highly susceptible to contamination by harmful bacteria. Despite this, many still follow the high-risk practice of thawing their chicken at room temperature on the counter. Part of that cavalier attitude stems from a mistaken belief that, since the chicken will be cooked afterwards, it will be food safe by the time it reaches your table. That widely held opinion is inaccurate, sometimes tragically so. Cooking to a food safe temperature of 165 degrees Fahrenheit, as recommended by the U.S. Department of Agriculture, doesn't kill all of the bacteria. It does reduce their numbers sharply, but the higher the bacteria population before cooking, the more that remain after cooking. More importantly, some bacteria associated with chicken -- including Staphylococcus aureus and E. coli -- produce heat-stable toxins that can make you seriously ill, even after the bacteria are killed. Most bacteria, including the ones that are potentially harmful to humans, reproduce best within a specific range of temperatures. Below 40 F or above 140 F they're busy trying to survive, and that means they aren't reproducing in your food. That's why refrigerators keep foods below 40 F, and restaurant steamer tables keep it above 140 F. The hundred degrees in between is referred to as the food safety "danger zone," where bacteria can reproduce freely. That's important, because most dangerous bacteria must reach a specific population -- the infective dose -- before they can make you ill. When you thaw chicken at room temperature, the outer edges can begin breeding bacteria before the middle begins to thaw. Rather than leaving chicken out on your kitchen counter, follow one of the handful of foodsafe thawing techniques. The best is simply to leave the chicken in your fridge until it thaws. That way, it never reaches an unsafe temperature. If you haven't thought that far ahead, you can safely thaw chicken or other foods in a bowl under cold running water. This can take as little as 30 minutes, for small boneless cuts. As a last resort, you can thaw the chicken in your microwave. Only use the microwave if you're going to cook the chicken immediately, because it heats unevenly and can create "hot spots" where bacterial activity is high. If you've thawed your chicken safely and cooked it to the appropriate temperature, you've made a good start. However, there are a few other important points that contribute to complete food safety at home. First, wash your hands, work surfaces and utensils scrupulously with hot, soapy water before you start. 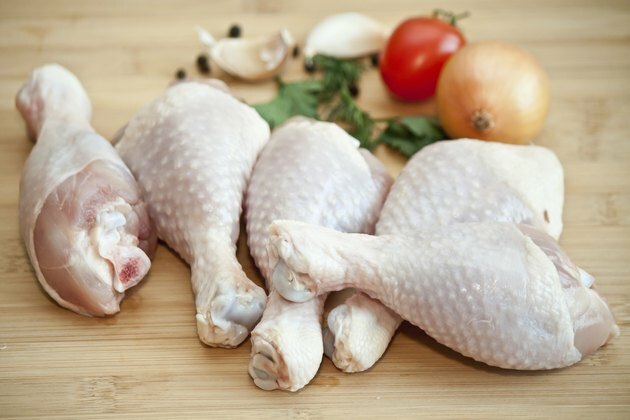 That minimizes the risk of bringing bacteria to the chicken yourself. Second, wash and sanitize any surface the raw chicken has touched. Never use the same hand, or utensils, to handle other foods after they've touched raw chicken. Finally, once the bird is cooked, handle the leftovers safely. Get them into your fridge or freezer within two hours of the meal, so bacteria can't become reestablished. Is It Safe to Cook Chicken in the Crock-Pot?